I edited this post from Tuesday to include why I like each of my favorite nurseries, so check it out! My husband and I have our own rooms. Well, technically, his room is our room because we both sleep there, but we call the guestroom “my” room because I use the closet in there. Yes, my husband has a bigger closet than I do. Yes, I’m a little jealous. Soon, the guestroom will become the nursery and I’m going to have to move most of my clothes into our master closet (which means my husband is going to have to get rid of some stuff). I know a baby/toddler doesn’t need a whole closet of their own, so I’m going to use half of it for special occasion pieces, but I want to move my everyday clothes into our room so I won’t have to disturb the baby when he or she is sleeping and I need to get ready or do laundry. I decided the first step in this process should be to go through all of my everyday clothes and pack up the things I can’t wear now that my stomach is protruding. I know that those clothes will be out of commission for longer than just my pregnancy, so I think packing them in a big plastic bin for 9-12 months is a good idea so I don’t have to worry about taking up valuable space in our soon-to-be shared closet. I put my bras in there, too since I can’t wear them anymore. I have two bras I can wear now and I’m sure I’ll need more before I have the baby (and after for nursing), but my bra drawer was getting really full so I decided to store those as well as some spanx. That last one should have gone into a giveaway bag, but I wasn’t ready to deal with that just yet, so I just packed them up anyway. How often to you go through your closet to get rid of stuff? Did you or would you pack away your pre-pregnancy clothes or would you just leave them in your closet? 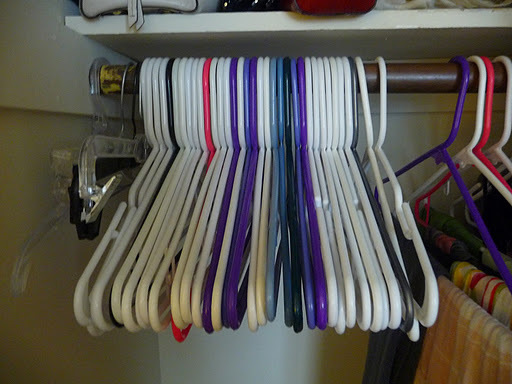 We have a similar set up – my clothes are in the guest room closet and hubby's clothes are in "our" room's closet – the one exception is that my closet is the bigger of the two! I went through my clothes two weekends ago and packed some away to make room for pregnancy clothes, too! I just went through all of my clothes too just because gettigng ready was taking forever. It was annoying to try on everything to see how it would fit on this belly. I figured it would be easier with less options, let alone a bunch of things don't fit. Other than being preg I love going through my closet and donating. Since most of my shopping is done thirsting i feel good about donating AND buying new pieces.